Decisions, Decisions! The Daily Nest: Decisions, Decisions! The outdoor remodel is coming along and although its a total mess, I can see the light at the end of the tunnel. Its looking great! A real entry where the front door will be protected from the elements and most importantly it gives the house some WOW factor!! Now my big decision that I have. I know! I know! You're saying to yourself, "Thats your big decision?" Hey I didn't say my life was complicated or glamorous, but its all I got right now! 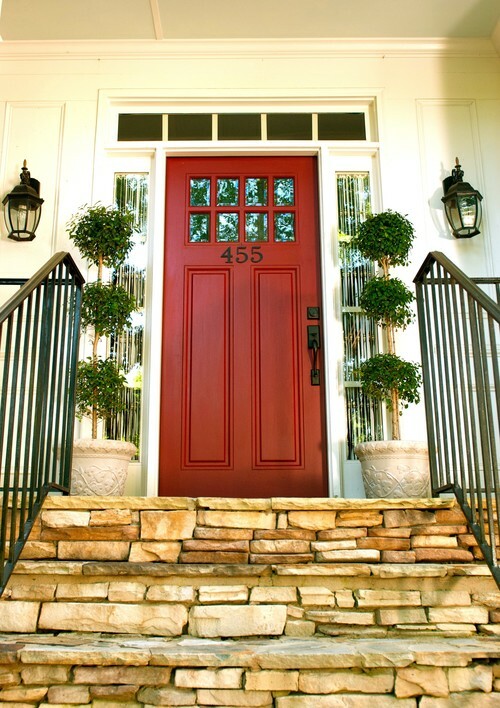 But I would state that the color of your front door plays a very important part in your exteriors appeal. A house is only as good as its front door! Now take that to the bank! Well, I wish I could take it to the bank! Because then I wouldn't be sweating bullets over this remodel! But on to the subject at hand. Heres whats swirling around in my little brain right now! 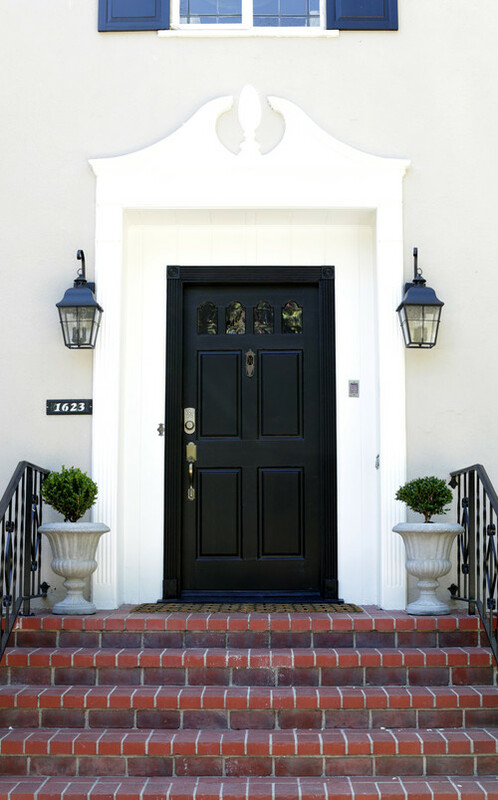 A black front door is elegant and dramatic! I think it would work well with the stone work and the house color. Although the house color might be changed to a light gray. Another decision. A black door works well with any and all colors. Its extremely versatile. The only negative that I can think of is it might make the area feel too dark. Which is one thing that I'm fighting against. 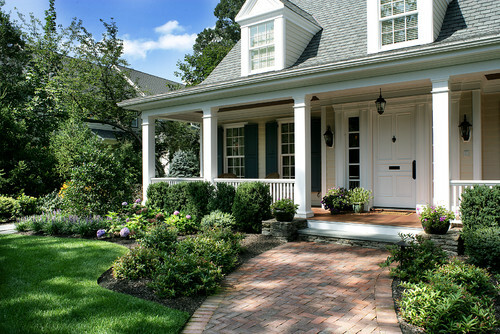 I love the way the big ole porch opens the door area up! So the last thing I want to do is make it feel dark! Hmm...decisions! This picture just makes me happy! Its shown with stacked stone similar to what ours will look like too! One thing that I DON'T love about my current yellow door is when the holidays roll around its very difficult to decorate with. Now a red door on the other hand! Holy moly would that scream, CHRISTMAS HOUSE!! And since we're talking about my yellow door.. I do love this color. Its called Beeswax by Sherwin Williams. It reminds me of buh-ta (butter) and is so happy looking! And I could just stick with this, but I would love to do something different. Such a classic! Clean, fresh and crisp! Movie house is what a white front door represents to me! Negatives-It will show dirt and here in Florida with the humidity it might mildew. But with the white columns, and new white carriage style garage door it would tie in nicely giving the exterior a seamless look. So there you have it my decisions for the week! I would love for you to weigh in, because I value your opinion! So take a moment and leave me a comment below!